Saul Steinberg’s Mural of Cincinnati will be on view to the public in the Cincinnati Art Museum’s newly renovated Schmidlapp Gallery beginning on February 16, 2018. Sponsored by the Cincinnati Art Museum’s Founders Society in honor of its 30th anniversary, the mural will be on display long-term for the first time since 1982. Saul Steinberg’s Mural of Cincinnati has a one-of-a-kind history. It adorned the wall of the Terrace Plaza Hotel’s Skyline Restaurant, an icon of modernism, starting in the late 1940s. Cincinnati businessman John J. Emery, Jr. commissioned a mural for the hotel’s Gourmet Room from Joan Miró and a mobile for the lobby from Alexander Calder. 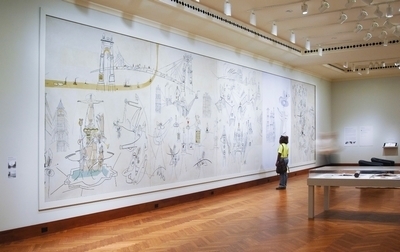 Saul Steinberg’s mural was the third commission. Saul Steinberg, a Romanian émigré artist known principally for his witty drawings for The New Yorker, was also expanding his reputation through the exhibition of his work at art galleries and museums. This validation by the art world, combined with his success as a commercial artist, led to commissions for murals. The Cincinnati mural, his second, created a delightful atmosphere in its chic setting by including city landmarks—Tyler Davidson Fountain, the Roebling Suspension Bridge and the Mount Adams incline—amid imaginary architecture and whimsical vignettes of urban entertainment. When Thomas Emery’s Sons, Inc. sold the hotel to the Hilton Corporation, Emery donated the three works of art to the Cincinnati Art Museum. In 2006, a prestigious Save America’s Treasures Grant funded the conservation of the Steinberg mural, restoring the balance between the delicate linear design and the white background. Steinberg’s Mural of Cincinnati will be reunited with the Terrace Plaza’s Miró mural and Calder mobile, both on view nearby in the Carol Ann and Ralph V. Haile, Jr., Gallery adjacent to the museum’s Terrace Café. The museum re-opened the modernized Schmidlapp Gallery on October 12, 2017. The innovative transformation was funded partially by a $1 million grant from the Jacob G. Schmidlapp Trusts, Fifth Third Bank, Trustee along with additional financial support from the State of Ohio. Installation of the Saul Steinberg mural was generously sponsored by museum Trustee Barbara Weyand and the many donors who matched her gift in honor of the 30th Anniversary of the Founders Society. The new space includes a wall of windows for natural light, couches and chairs to encourage congregation, individual looking lounges and detailed curatorial interpretation around singular artworks, new flooring to visually connect to the Bimel Courtyard, lighting and state-of-the-art temperature and humidity systems for the artwork. It also includes MyCAM, which features touch tables to help visitors create thematic art hunts to personalize their museum experience. In celebration of Steinberg’s mural, over 200 of the museum’s donors and supporters will attend a special private Schmidlapp Gallery Opening event, including dinner by-the-bite, a cocktail hour, live entertainment and a ribbon cutting ceremony the evening of February 15. This winter, six 7½-foot-square Formica laminate mosaics by Curtis Goldstein and Matt Lynch have occupied the north-eastern wall of the gallery. In June 2018, these works will be shown as part of a suite of 10 artworks by Goldstein and Lynch at the Weston Art Gallery presented in conjunction with an exhibition of studies, photographs and historical material from the Reiss project. The Schmidlapp Gallery, originally part of the Schmidlapp Wing or Schmidlapp Extension, was the first expansion beyond the museum’s original 1886 building. The gallery has been home to sculpture, antiquities and, more recently, museum “icons” by Van Gogh, Gainsborough, Warhol and Tiffany.